, the most ancient of the Greek poets extant, has been called the Father of poetry; but, however celebrated by others, he has been so very modest about himself, that we do not find the least mention of him throughout his poems: Where he was born, who were his parents, at what exact period he lived, and ulmost every circumstance of his life, remain at this day in a great measure, if not altogether unknown. The Arundel marbles say that he flourished in the tenth century before Christ, and other authorities say the eighth. 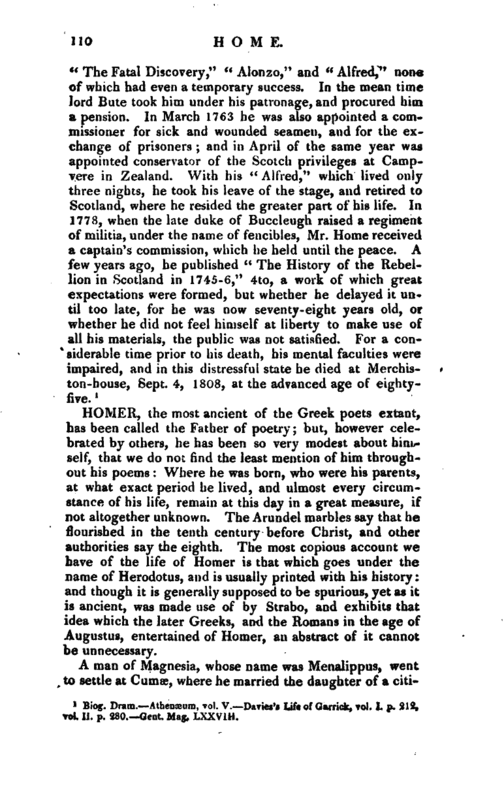 The most copious account we have of the life of Homer is that which goes under the name of Herodotus, and is usually printed with his history: and though it is generally supposed to be spurious, yet as it is ancient, was made use of by Strabo, and exhibits that idea which the later Greeks, and the Romans in the age of Augustus, entertained of Homer, an abstract of it cannot be unnecessary. A man of Magnesia, whose name was Menalippus, went to settle at Cumae, where he married the daughter of a | citizen called Homyres, and had by her a daughter called Critheis. The father and mother dying, Critheis was left under the tuition of Cleonax her father’s friend; and, suffering herself to be deluded, became pregnant. The guardian, though his care had not prevented the misfortune, was however willing to conceal it; and therefore sent Critheis to Smyrna. 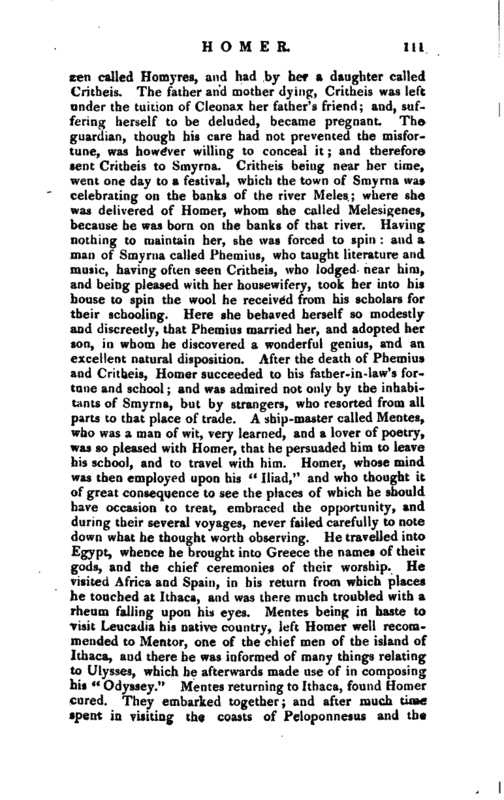 Critheis being near her time, went one day to a festival, which the town of Smyrna was celebrating on the banks of the river Meles; where she was delivered of Homer, whom she called Melesigenes, because he was born on the banks of that river. Having nothing to maintain her, she was forced to spin: and a man of Smyrna called Phemius, who taught literature and music, having often seen Critheis, who lodged near him, and being pleased with her housewifery, took her into his house to spin the wool he received from his scholars for their schooling. Here she behaved herself so modestly and discreetly, that Phemius married her, and adopted her son, in whom he discovered a wonderful genius, and an excellent natural disposition. After the death of Phemius and Critheis, Homer succeeded to his father-in-law’s fortune and school; and was admired not only by the inhabitants of Smyrna, but by strangers, who resorted from all parts to that place of trade. A ship-master called Mentes, who was a man of wit, very learned, and a lover of poetry, was so pleased with Homer, that he persuaded him to leave his school, and to travel with him. Homer, whose mind was then employed upon his “Iliad,” and who thought it of great consequence to see the places of which he should have occasion to treat, embraced the opportunity, and during their several voyages, never failed carefully to note down what he thought worth observing. He travelled into Egypt, whence he brought into Greece the names of their gods, and the chief ceremonies of their worship. He visited Africa and Spain, in his return from which places he touched at Ithaca, and was there much troubled with a rheum falling upon his eyes. Mentes being in haste to visit Leucadia his native country, left Homer well recommeMcled to Mentor, one of the chief men of the island of Ithaca, and there he was informed of many things relating to Ulysses, which he afterwards made use of in composing his “Odyssey,” Mentes returning to Ithaca, found Homer cured. They embarked together; and after much time spent in visiting* the coasts of Peloponnesus and the | Islands, they arrived at Colophon, where Homer was again troubled with the defluxion upon his eyes, which proved so violent, that he is said to have lost his sight *. This misfortune made him resolve to return to Smyrna, where he finished his “Iliad.” Some time after, the baJ state of his affairs obliged him to go to Cumae, where he hoped to* have found some relief. Stopping by the way at a place called the New Wall, which was the residence of a colony from Cumae, he lodged in the house of an armourer called Tichius, and recited some hymns he had made in honour of the Gods, and his poem of Amphiaraus’s expedition against Thebes. After staying here some time and being greatly admired, he went to Cumae; and passing through Larissa, he wrote the epitaph of Midas, king of Phrygia, then newly dead. 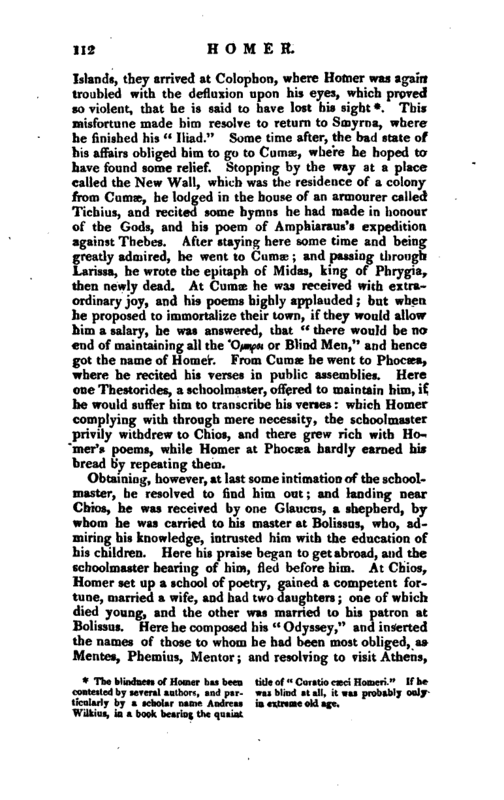 At Cumas he was received with extraordinary joy, and his poems highly applauded; but when he proposed to immortalize their town, if they would allovr him a salary, he was answered, that “there would be no end of maintaining all the ’O^oi or Blind Men,” and hence got the name of Homer. From Cumae he went to Phocasa, where he recited his verses in public assemblies. Here one Thestoricles, a schoolmaster, offered to maintain him, if he would suffer him to transcribe his verses: which Homer complying with through mere necessity, the schoolmaster privily withdrew to Chios, and there grew rich with Homer’s poems, while Homer at Phocaea hardly earned his bread by repeating them. The blindness of Homer has been contested by several authors, and particularly by a scholar name Andreas Wilkius, in a book bearing the quaint title of “Curatio caeci Honaeri.” If he was blind at all, it was probably only in extreme old age. | he made honourable mention of that city, to dispose the Athenians for a kind reception of him. But as he went, the ship put in at Samos, where he continued the whole winter, singing at the houses of great men, with a train of boys after him. In the spring he went on board again, in. order to prosecute his journey to Athens; but, landing by the way at Chios, he fell sick, died, and was buried on the sea-shore. 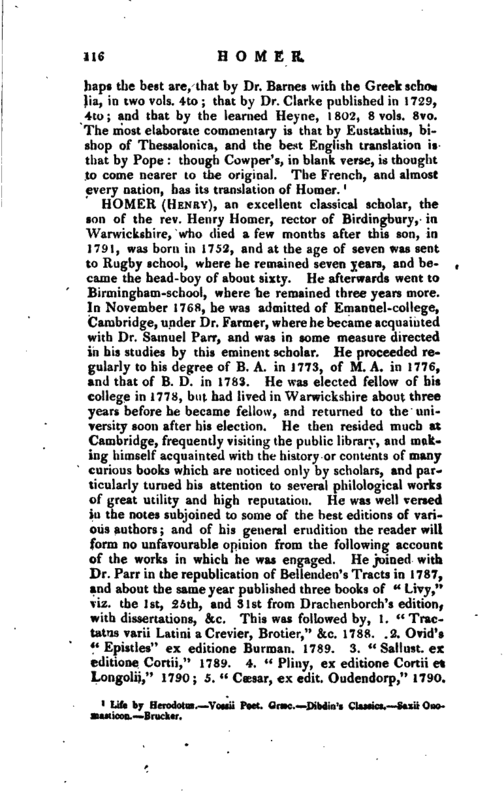 This is the most regular life we have of JHomer; and though probably but little of it is exactly true, yet it has this advantage over all other accounts which remain of him, that it is more within the compass of probability. The only incontestable works which Homer has left behind him, are the “Iliad,” and the “Odyssey.” The “Batrachomyomachia,” or “Battle of the Frogs and Mice,” has been disputed, but yet is allowed to be his by many authors. The Hymns have been doubted also, and attributed by the scholiasts to Cynaethus the rhapsodist: but Thucydides, Lucian, and Pausanias, have cited them as genuine. We have the authority of the two former for that to Apollo; and of the last for a “Hymn to Ceres,” of which he has given us a fragment. The whole hymn has been lately found by Matthsei at Moscow, and was published by Ruhnkenius in 1782, at Leyden. A good translation has since been given by Mr. Hole. The Hymn to Mars is objected against; and likewise the first to Minerva. The “Hymn to Venus” has many of its lines copied by Virgil, in the interview between yEneas and that goddess in the first “Æneid.” But whether these hymns are Homer’s or not, they were always judged to be nearly as ancient, if not of the same age with him. Many other pieces were ascribed to him: “Epigrams,” the “Margites,” the “Cecropes,” the “Destruction of Oechalia,” and several more. Time may here have prevailed over Homer, by leaving only the names of these works, as memorials that such were once in being; but, while the “Iliad” and “Odyssey” remain, he seems like a leader, who, though he may bavo^ failed in a skirmish or two, has carried a victory, for which he will pass in triumph through all future ages. Homer had the most sublime and universal genius that the world has ever seen; and though it is an extravagance of enthusiasm to say, as some of the Greeks did, that all knowledge may be found in his writings, no man penetrated deeper into the feelings and passions of humaa | nature. He represents great things with such sublimity, and inferior objects with such propriety, that he always makes the one admirable, and the other pleasing. Strabo, whose authority in geography is indisputable, assures us, that Homer has described the places and countries, of which he gives an account, with such accuracy, that no man can imagine who has not seen them, and no man can observe without admiration and astonishment. Nothing, however, can be more absurd, than the attempts of some critics, who have possessed more learning and science than taste, to rest the merit of Homer upon the extent of his knowledge. An ancient encomiast upon Homer proves him to have possessed a perfect knowledge of nature, and to have been the author of the doctrine of Thales and Xenophanes, that water is the first principle of all things, from his having called Oceanus the parent of nature; and infers, that he was acquainted with Empedocles’ doctrine of friendship end discord, from the visit which Juno pays to Oceanus and Thetis to settle their dispute: because Homer represents Neptune as shaking the earth, he concludes him to have been well acquainted with the causes of earthquakes; and because he speaks of the great bear as never touching the horizon, he makes him an eminent astronomer. The truth is, the knowledge of nature, which poetry describes, is very different from that which belongs to the philosopher. It would be easy to prove, from the beautiful similes of Homer, that he was an accurate observer of natural appearances; and to show from his delineation of characters, that he was intimately acquainted with human nature. But he is not, on this account, to be ranked with natural philosophers or moralists. Much pains have been taken to prove, that Homer expresses just and sublime conceptions of the divine nature. And it will be acknowledged, that, in some passages, he speaks of Jupiter in language which may not improperly be applied to the Supreme Deity. 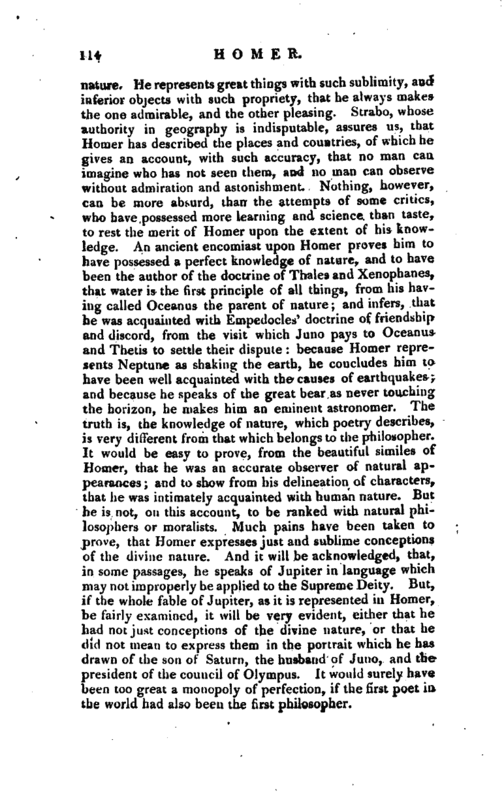 But, if the whole fable of Jupiter, as it is represented in Homer, be fairly examined, it will be very evident, either that he had not just conceptions of the divine nature, or that he did not mean to express them in the portrait which he has drawn of the son of Saturn, the husband of Juno, and the president of the council of Olympus. It would surely have -been too great a monopoly of perfection, if the first poet in the world had also been the first philosopher. | Homer has had his enemies; and it is certain, that Plato banished his writings from his commonwealth; but lest this should be thought a blemish upon the memory of the poet, we are told that the true reason was, because he did not esteem the common people to be capable readers of them. They would be apt to pervert his meaning, and have wrong notions of God and religion, by taking his bold and beautiful allegories in a literal sense. Plato frequently declares, that he loves and admires him as the best, the most pleasant, and divine of all poets, and studiously imitates his figurative and mystical way of writing: and though he forbad his works to be read in public, yet he would never be without them in his closet. But the most memorable enemy to the merits of Homer was Zoilus, a snarling critic, who frequented the court of Ptolemy Philadelphus, king of Egypt, and wrote ill-natured notes upon his poems, but received no encouragement from that prince; on the contrary, he became universally despised for his pains, and was at length put, as some say, to a most miserable death. 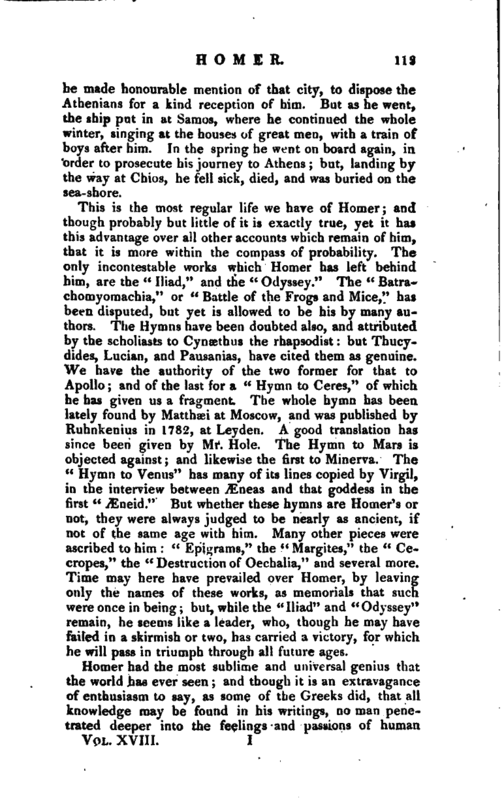 It is said that though Homer’s poems were at first published all in one piece, and not divided into books, yet every one not being able to purchase them entire, they were circulated in separate pieces; and each of those pieces took its name from the contents, as, “The Battle of the Ships;” “The Death of Dolon;” “The Valour of Agamemnon;” “The Grot of Calypso;” “The Slaughter of the Wooers,” &c. nor were these entitled books, but rhapsodies, as they were afterwards called, when they were divided into books. Homer’s poems were not known entire in Greece before the time of Lycurgus; whither that law-giver being in Ionia carried them, after he had taken the pains to transcribe them from perfect copies with his own hands. This may be called the first edition of Homer that appeared in Greece, and the time of its appearing there was about 120 years before Rome was built, that is, about 200 years after the time of Homer. 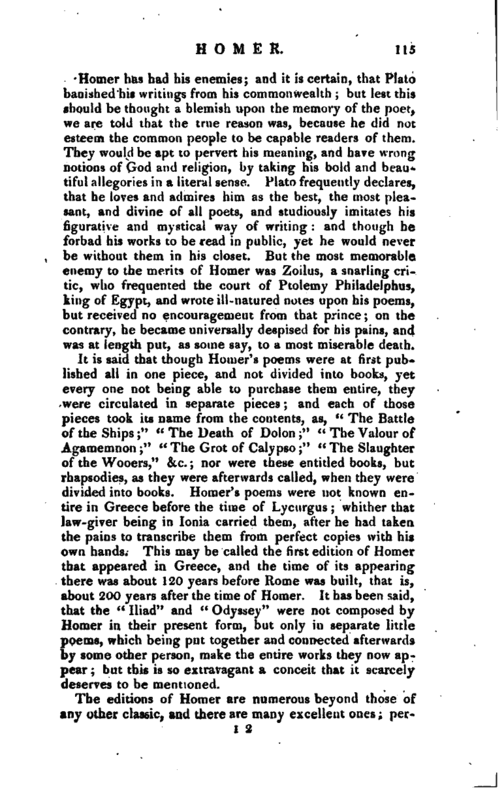 It has been said, that the “Iliad” and “Odyssey” were not composed by Homer in their present form, but only in separate little poems, which being put together and connected afterwards by some other person, make the entire works they now appear; but this is so extravagant a conceit that it scarceJy deserves to be mentioned. Life by Herodotus. Vossii Poet. Græc. Dibdin’s Classics. —Saxii Onomasticon. Brucker.